You're viewing a category page for Tanzania. 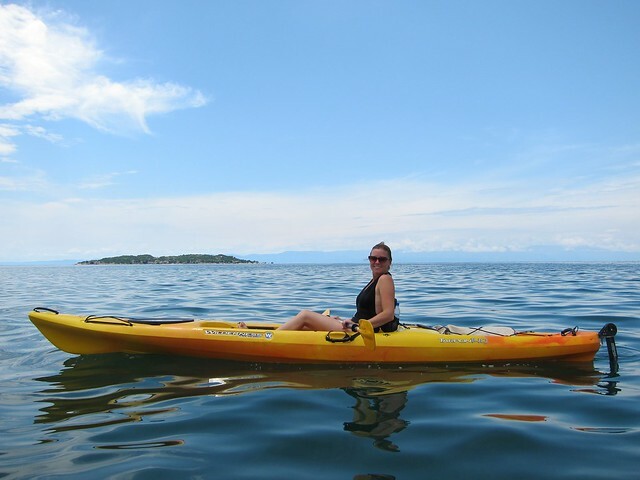 Maybe you'd also be interested in our pictures from Tanzania, or our experiences with money or visas in Tanzania? We loved Tanzania, and found so many parts of it so photogenic that inevitably took too many videos (is videogenic a word? ), so here's another dump of those videos that didn't make their way into any of our posts. 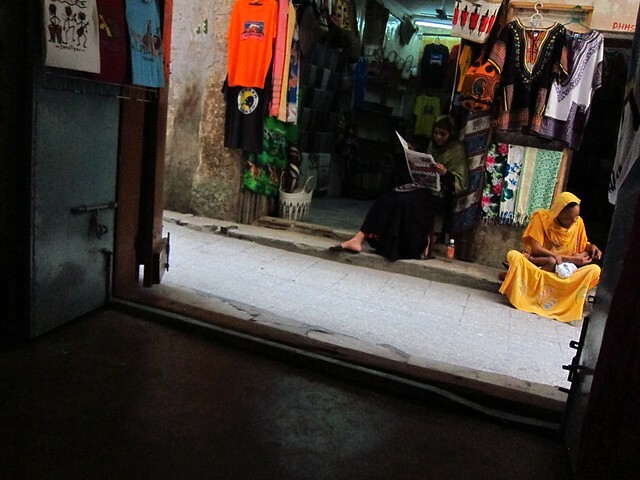 Stone Town, the ancient part of Zanzibar Island's largest city, is one of the most unique and beautiful places we've ever been, and instantly one of my favorite places we've visited. Its most striking feature is the layout of its streets, a winding, curving, jumbled maze of narrow alleyways that makes the city feel alive and constantly changing, and completely bewildered our map- and grid-city-accustomed brains. The fact that most of the streets are so narrow, permitting only foot and bicycle traffic, that you can only see a few paces ahead since they are always curving, splitting, ending, and beginning, and that they seem so claustrophobic due to the seemingly haphazard pile of buildings hanging over them were a little off-putting at first, reminding us of shady alleyways we would fear to enter in any large Western city. 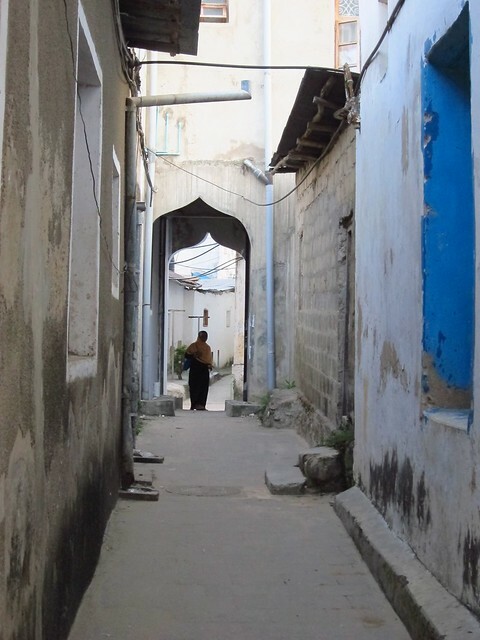 As one of East Africa's most important trading posts with the Middle East and India, Zanzibar, and Stonetown in particular, accumulated many inhabitants from those regions, and with them came their food, tea, and coffee. 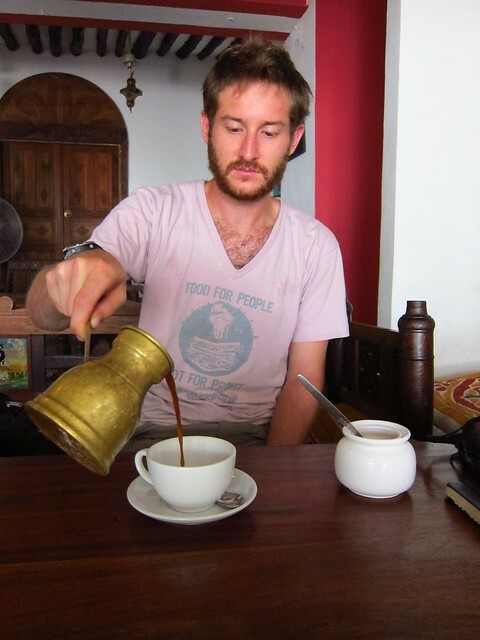 On our trip we have learned that most of the world drinks instant coffee, and have thus begun to cherish those few places which have an established coffee culture, and Stonetown indeed has a strong and unique one. From comfortable cafes pouring lattes and the local specialty of coffee flavored with cinnamon, clove, and ginger to old men boiling pots over coal fires and pouring syrupy-thick brew into mismatched porcelain espresso cups on the corner, we got our fill and left pleasantly caffeinated. We also ate our fill of local food: two visits to lovely Forodhani gardens for uber-fresh seafood and "Zanzibar Pizza" (the subject of our next post), as well as a delicious local dinner in a family's house, only accessible--in traditional Stone Town style--off a sidestreet, down the driveway, past the construction site, between the sheets of corrugated steel, turn right at the toilet fixture, then left at the pile of iron bars, then ring the bell and make sure to take your shoes off when greeted by the eight-year-old hostess. 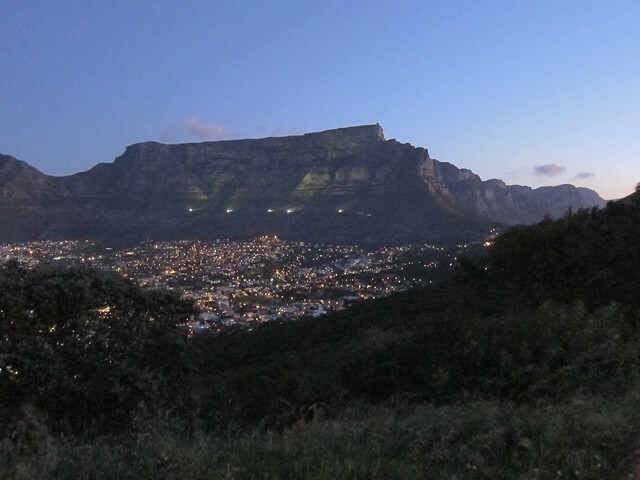 Dinner was upstairs and served family-style, course after course of Indian-African coastal fusion left us happily full. Along with climbing Kilimanjaro and going on safari, the third top destination (for good reason) in Tanzania is a trip to Zanzibar. Some of you may not know what/where Zanzibar really is, so first, some quick and cursory history! 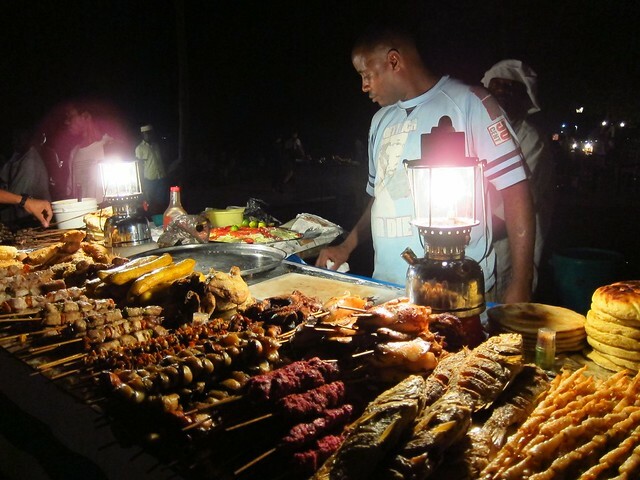 The Zanzibar Archipelago, which includes the islands of Zanzibar and Pemba, served as one of East Africa's most important trading centers for centuries. Its geographical position off the coast of East Africa in the Indian Ocean made it the logical location for supplying slaves, gold, ivory and wood to the Persian Gulf, India, and Asia. Along with spices and textiles from the East came Islam and Arabs. In fact, Omani Arabs had control over the islands for several hundred years, first on their own and then ruling under a British Protectorate, until Zanzibari independence in 1963. In 1964, Zanzibar was united with Tanganyika (mainland Tanzania), and became the United Republic of Tanzania. 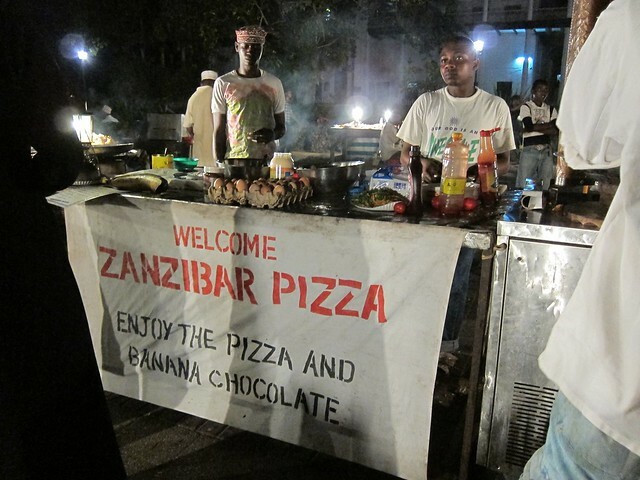 However, Zanzibar still maintains a much different feel from the mainland. As soon as you step off the plane or ferry, it's as if you've entered the Middle East. Today, Zanzibar Island is solidly on the tourist circuit and is most famous for Stone Town and its gorgeous beaches, especially those on the northern and eastern coasts. 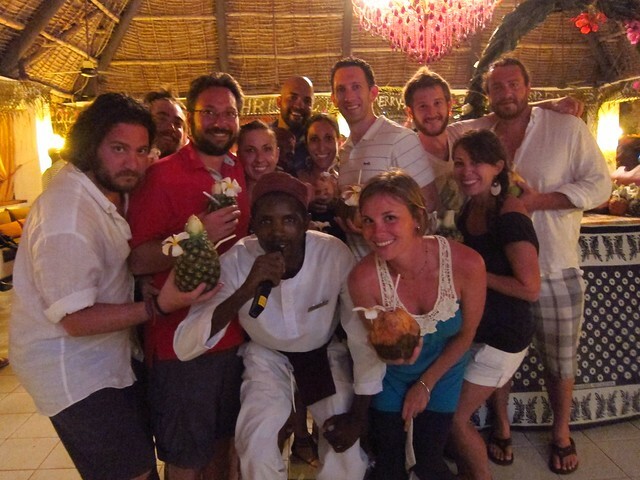 Since our group was so large, and everyone was looking for a few days of blissful relaxation, we booked rooms months in advance at a fancy resort on the eastern side of Zanzibar Island where we would spend five nights over New Year's Eve together. I'll spare you the details of the nightmare we went through with finding, booking, and actually keeping the reservation, but suffice it to say that we worked very hard to stay at this place! It was our first time doing an all-inclusive resort together, but it was the logical choice for a group of 12 friends-- meeting up, eating meals together, and organizing activities is just easier in that kind of setting. The location and facilities were gorgeous. Much of the island is affected by dramatic high and low tides, so the water's edge at low tide is about 150 meters out, but the resort had put in a walkway, lest we hurt ourselves on the sharp intertidal rocks between the beach and the ocean! We spent our days lounging at the large salt water pool (with swim up bar!) 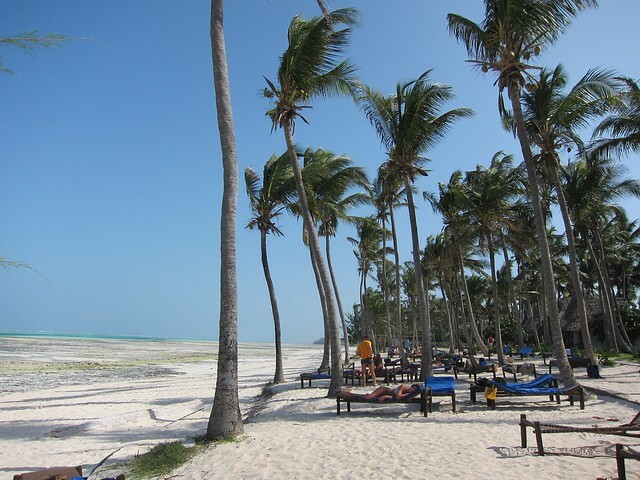 or under the palm trees on the beach, taking dips in the crystal-clear ocean, spending sun breaks and playing cards at the airy bar (creatively named Zanzi...bar), and eating large meals at the buffet restaurant. In many ways, the all-inclusive experience shelters you from where you are: at times, it almost felt as though we could have been anywhere-- the Dominican Republic, Cancun, Hawaii -- but for constantly hearing the staff say"pole pole" (Swahili for "slowly, slowly"-- and they aren't exaggerating!) and "hakuna matata" (Swahili for "no worries" -- you've seen Lion King, yes?). The resort is owned and run by Italians, which means that almost all the clientele are Europeans. If nothing else, that at least meant that pasta was served at every meal, and I got to brush up on my wishy-washy knowledge of a few romance languages. However, it seems as though tourists come here to "experience" Tanzania with all the European comforts they are used to, which ends up resulting in somewhat forced nightly cultural "performances" that ranged from seemingly genuine, to entertaining (one of our friends ended up in the Masaai dance circle with a boa constrictor around his neck! ), to somewhat circus-like and devoid of any cultural connection. 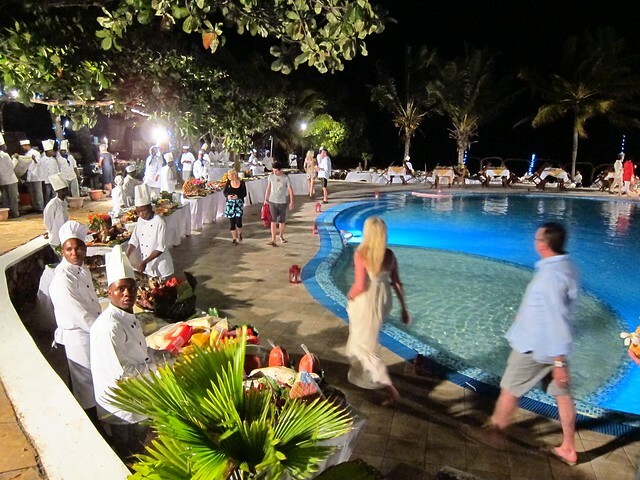 I will give the place an absolute hats-off for the New Year's Eve dinner they pulled off: every type of food imaginable was served in a gorgeous setting around the pool and on the beach, and everyone who tasted it agreed that the grilled lobster was by far the most delicious we had ever tasted. 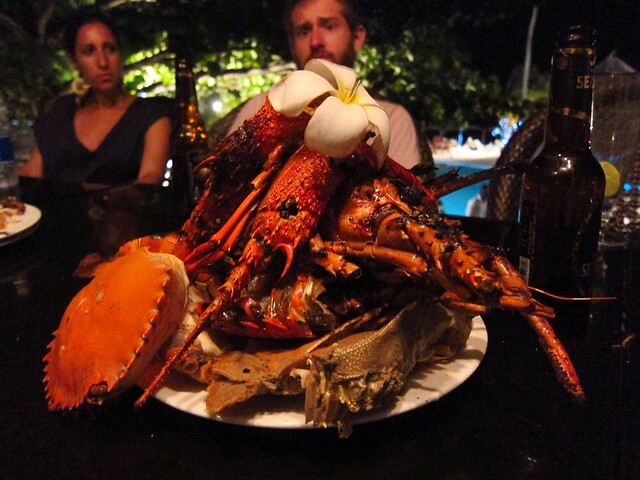 It was quite possibly the most indulgant and opulent spread of food many of us had ever seen. In the end, the resort met our expectations for pampering and relaxation (except for a few of our friends who ended up with various stomach bugs-- we felt awful for them! 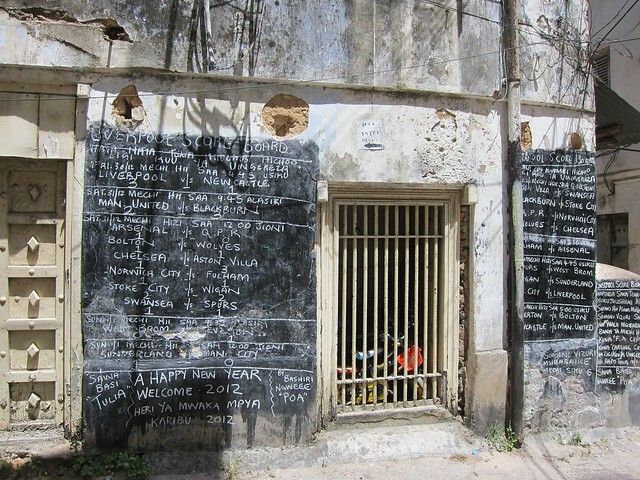 ), but I don't think our five days there gave us a good feeling for Zanzibari culture. Then again, I don't think anyone should expect these kind of fancy resorts to genuinely convey the culture of the people living outside the walls. We enjoyed our stay for what it was, and the most important part of the vacation was spending quality time with our DC friends! It's simple: Tanzania won the soda lottery. I don't know what we Americans did to piss off the Coca-Cola company, causing them to deprive the U.S. of the incredibly tasty Krest Bitter Lemon and Stoney Tangawizi, but trust me, we're missing out! Bitter Lemon is refreshing, crisp, and tastes like a strong lemonade but without the sugary aftertaste. It's delicious on its own, but also works wonderfully with gin and/or Campari. 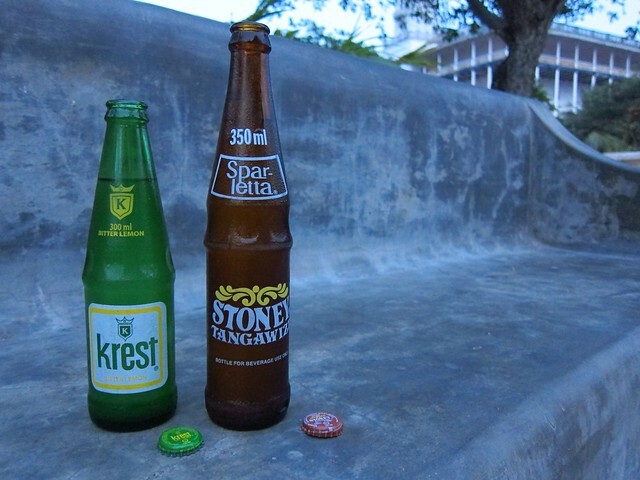 Stoney Tangawizi, which would probably be better suited as a rapper's name in the U.S., is essentially a ginger beer. We learned that Tangawisi is a Congolese medicinal drink containing lots of ginger. It's still sweet like ginger ale, but spicier, and also very refreshing. It too makes a tasty mixer and we especially enjoyed it with dark, spiced rum. 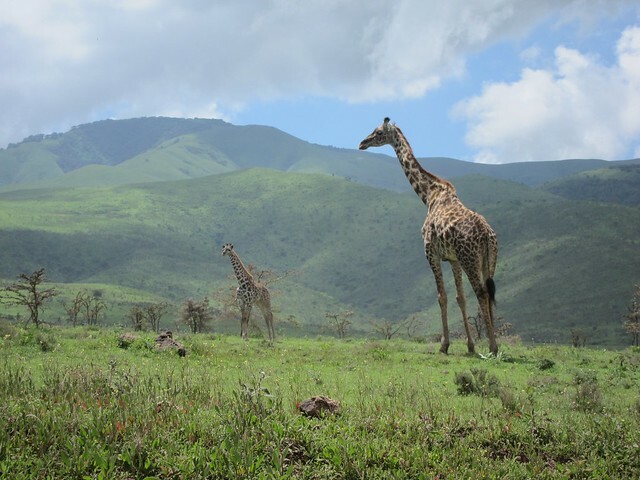 Having successfully bagged our first ever high-altitude peak, it was time for some wildlife viewing in northern Tanzania's famous national park circuit. Six more of our friends from DC met us in Moshi on Christmas Eve, making for a total of 12 of us, and we spent the day catching up and had some of the best Indian food we've ever tasted (although perhaps it tasted so good because it took two hours to arrive?!). 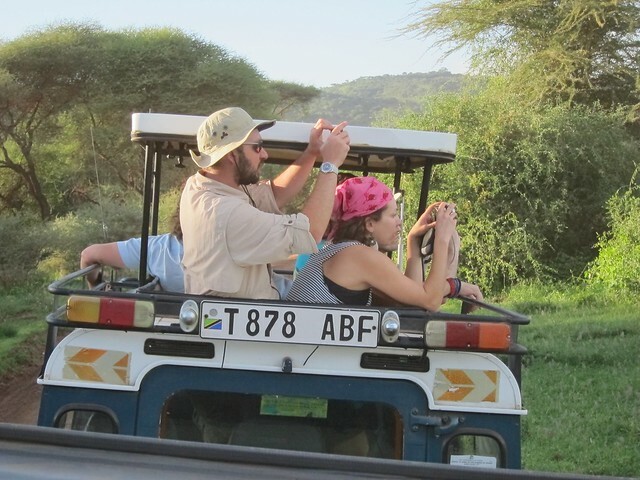 We packed our bags and piled into two safari Land Rovers and headed first to Lake Manyara National Park, which is a relatively small park and makes a good introduction to a safari. We saw tons of baboons, monkeys, giraffes, and hippos. We camped in a nearby campsite, had a delicious outdoor dinner, and drank gin and Krest Bitter Lemon-- probably one of the randomest ways to celebrate Christmas, but we were all happy to be with our second family! The next day we packed up and pretty much drove all day, through Ngorongoro Conservation Area into the Serengeti, perhaps the most well-known park in Tanzania, perhaps in all of Africa. As we neared the entrance gate we saw thousands of wildebeest, zebra and gazelle grazing in what seemed like an endless plain in every direction (Siringit does mean "endless plain" after all). 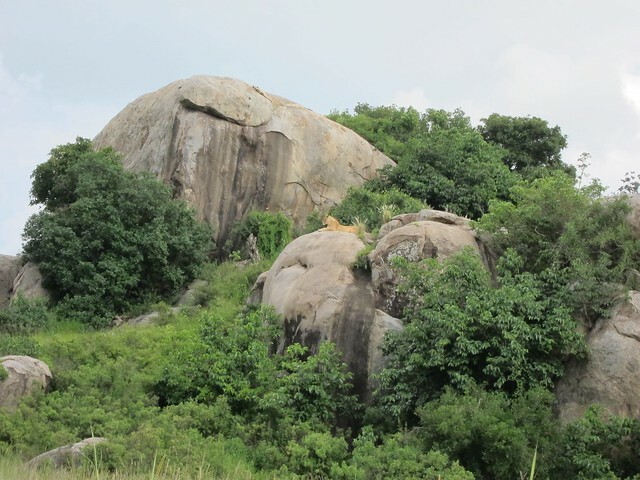 After a rather long wait for our permits at the gate, we drove toward our campsite, spotting a very Lion King-esque scene on the way: a lion sitting atop a huge rock formation, gazing at the vast expanse below. 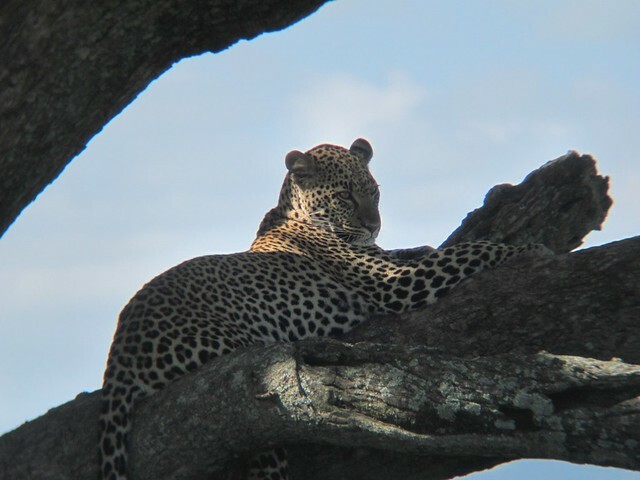 This was our first big cat sighting in Tanzania (and for most of our friends, their first big cat sighting ever!). After a flat tire on one of the jeeps that coincided with a very heavy but quick rainshower, we made it to the campsite and set up our tents in the mud. 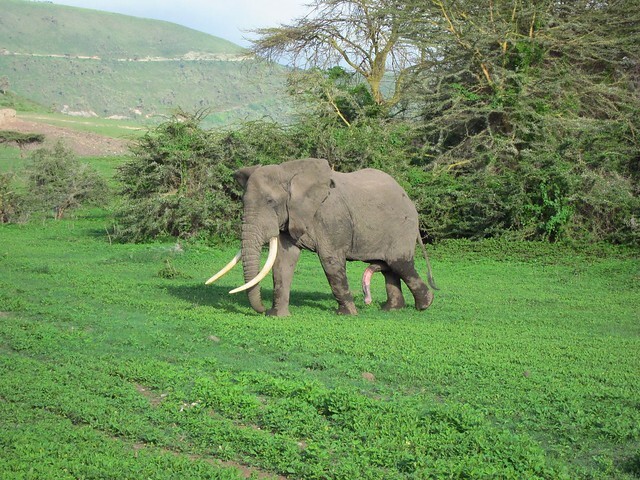 The next morning we embarked on an early morning game drive. Highlights included: two hippos on land (a rare sight in the daytime, as they spend most of their time in the water), three cheetahs peeking out of the tall grass, two leopards in nearby trees, five lions in a tree (which our jeep was the first to spot, so we had the view to ourselves for a few minutes! ), and a partridge in a pear tree (not really). The Serengeti is a huge park, and I don't think its size is lost on anyone who visits. Animals can sometimes seem to be few and far between (aside from the 2.5 million wildebeest, zebra and gazelles when they're all migrating together), but luckily all the drivers and guides radio each other to share the location of animals, so a sighting is never too long a drive away. 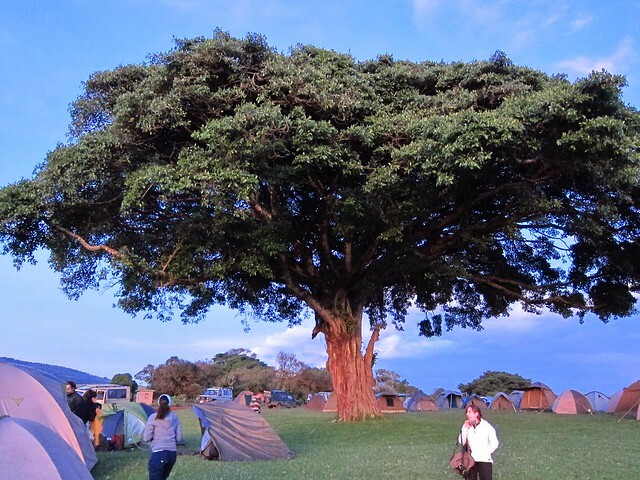 After a really satisfying few hours with our heads popped up out of the jeep, we drove back to Ngorongoro Crater, and set up camp for our third and final night at the most stunning campsite yet, overlooking the crater and surrounded by hills in almost all directions. 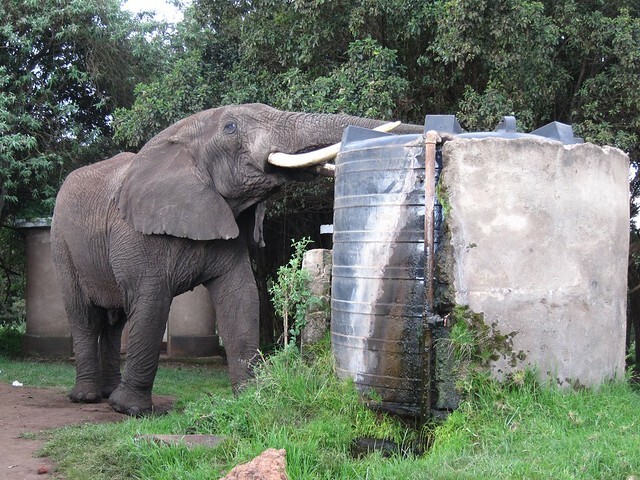 Not even 15 minutes after we arrived, an elephant wandered onto the campground and starting drinking from a huge water tank, allowing for some alarmingly close photo opps. We woke up early the next morning and headed into the crater, which used to be a huge volcano that collapsed an estimated two to three million years ago, leaving a 20-km wide caldera that is now filled with wide, flat grasslands, some forest areas, and a few lakes. This area was my favorite of the three parks we visited. The greenness and sheer numbers of all different kinds of animals--countless gazelles, impalas, zebra, wildebeest, elephants, lions, warthogs, flamingoes, an even a black rhino in the distance--all sharing the same plains and lakes leaves a visitor with an almost fairy tale-like impression. 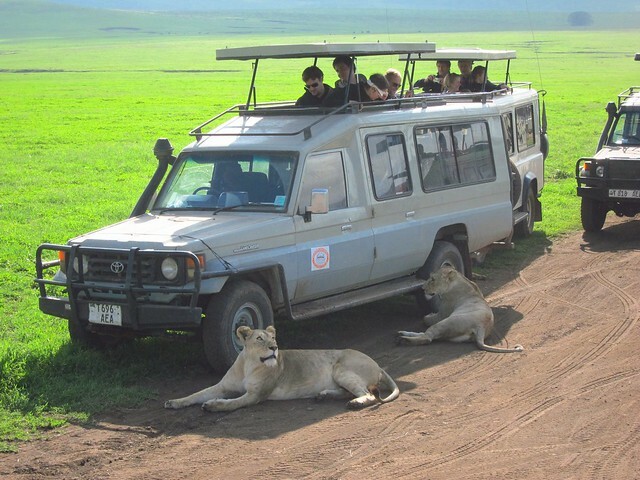 I will also never forget pulling up to a crowd of jeeps surrounding eight lions, some of whom had taken the liberty to lay in the shade just under the cars and right under our noses! Some of my favorite memories of the four days we spent wildlife viewing are not just the close-up sightings and the time spent driving through some gorgeous landscapes with our heads popped out of the roof, but also the bonding and catching up with our friends who we hadn't seen in six months during these long days in the jeeps. We're normally well prepared and well informed about the destinations that we visit, but this leg of the journey was special, everything being planned in advance by our wonderful friends who came halfway around the world to visit us. 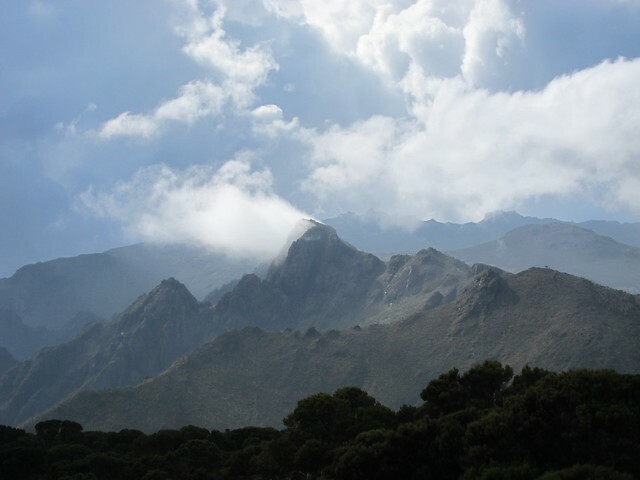 The agenda consisted of a seven-day climb of Mt. Kilimanjaro, a four-day safari through Northeast Tanzania's national parks, and five relaxing days at a beach resort on Zanzibar. 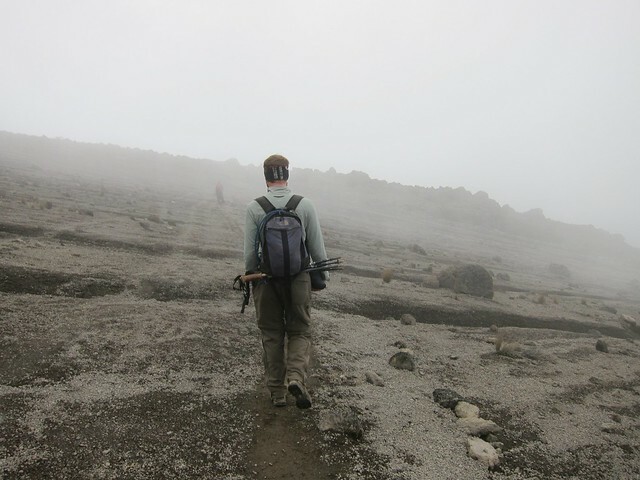 Because everything was set up in advance, we took the opportunity to take a break from planning and preparation and began the Kilimanjaro hike knowing blissfully little about it. It might be a good thing that we didn't know what to expect, because I don't think any reading or research would have prepared us for how hard an undertaking it turned out to be. 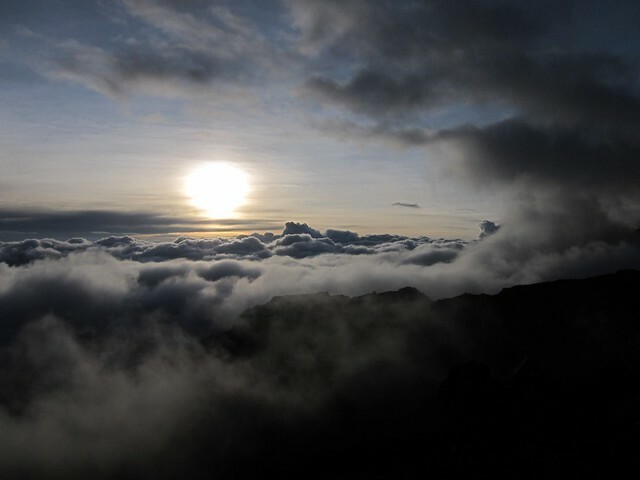 We opted to do the Machame route in seven days, allowing for an extra day of acclimitization, which would give us a better chance of actually making it to the summit. The first five days of the seven day trek were relatively benign; we marveled at the frequent and abrupt changes in flora and fauna, enjoyed the company of five of our long-lost friends, and saw some incredible views of the mountain's three peaks, the town of Moshi at its foot, and its smaller sister, Mount Meru, a few hundred kilometers away. We trekked from three to six hours per day, and the hiking ranged from slow and steady ascents through dry terrain to rock scrambles up steep, narrow, and wet passages. Our crew of guides, porters, cooks, waiters, and tent guys numbered 25, and they ensured our camp was set up each day well before we got there and that we were constantly well-fed and hydrated. During our down-time between arriving to camp in the afternoon and having dinner, we sat around the table in our mess tent, played cards, talked about the day's hike, and passed the time discussing topics such as how "technical" that day's toilet hole was (we're not sure why, but for some reason, potty talk ends up being the number one topic during multi-day treks!). Then came the summit push, and the expedition changed from a stroll through some moderate hills to a serious, high-altitude adventure that was more physically challenging than anything we've ever done before. Summit day actually starts at 11pm the night before. After an afternoon of rest, dinner, and a few hours of excited sleep, the alarm goes off, and we're bundling up in all our layers and headed to the mess tent for a cup of hot tea and the start of the final push. The first five hours or so are slow work, as much a mental challenge as a physical one. The altitude is finally getting to us (or maybe it's just the cold, lack of sleep, and unusual hour to be doing any kind of physical activity), and all our focus goes into keeping our feet moving forward, into making it to the next hourly break and deciding if our stomachs will be able to hold down the granola bars that are quickly freezing in our pockets. Mostly we just look at the circle cast by our headlamps, lighting the path and the heels of the person ahead of us; sometimes we look up at the star-filled sky or down at the shining grid of streetlights in the distance far below. Eventually the crescent moon rises ominously from behind us. We stop to breathe and look at these other sources of light because we seem to lose our balance if we take our eyes off the path ahead of us. Our hands and feet are freezing and totally numb. We start to lean a little too heavily on our walking sticks, often catching our eyes closing with each pause between steps; we are becoming totally exhausted. At about the time when we're starting to doubt we'll ever get to the top, starting to doubt our strength and resolve, we receive the good news that the furthest light we can see belongs to a hiker who has just reached the caldera. From there the trail flattens and we'll be all but sure to make it to the summit. But there's still nearly an hour's climb to reach that point, and frankly it doesn't look any closer than when we started five hours earlier. We continue to trudge along, our steps getting shorter and slower, less and less able to completely pick up our feet. Somehow the last hour passes, we reach Stella Point, and everything changes. The sky is beginning to lighten from behind us, the trail is now packed snow instead of loose gravel--and is far less steep than the rest of the ascent--and we begin to see a few people who have already reached the summit and are starting their return journey. They pass us a few words of encouragement. Instantly the torpor in our legs recedes, our bags no longer feel heavy, our heads become clear and focused, and we nearly run the final section to the summit. The sun transitions from a few orange spots on the horizon, through deep red, violet, and yellow light, and finally shines majestically on the tops of clouds as far as we can see. It's a different world up here: we're treated to incredible cloudscapes like you normally only see from plane windows, and there are beautiful and majestic glaciers in every direction, seemingly glowing in shades of blue, green, and white..
At 6:15 am, we finally reach Uhuru Peak, the highest point in Africa at 5895 meters above sea level, and the tallest freestanding mountain in the world! We snap a few obligatory photos--in our faces I'm sure you can see all the relief, accomplishment, and pride we were feeling at that moment--and turn around to begin the descent after about ten minutes. And at that moment we realize that we've been setting the wrong goal for ourselves all along: getting to the top is only getting halfway; we still have seven hours descent ahead of us. The adrenalin from summiting has run out, the lactic acid is back in full force and makes our legs feel like jello, and before long the relentless downward trudge on loose sandy gravel--which our friend Greg described as "a controlled fall"--makes our knees feel like toothpicks. Somehow: slowly, painfully, and exhaustedly, we make it down to base camp, where we are allowed to rest for one hour, and then eat an early lunch. Even though we've been up since 11:00 pm the night before, and have already forced our legs through over nine hours of ascent and descent, the day is not over yet: we have to continue down to a lower altitude to spend our last night on the mountain. We somehow muster a bit of energy to descend for another four hours to the hike's final camp, a push that was no doubt aided by the beer break we took halfway there (a can of Kilimanjaro has never tasted so good). 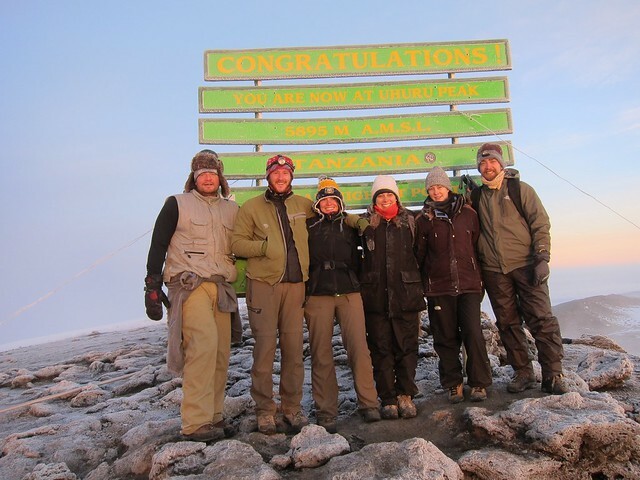 Once at our final camp, we are more exhausted than we've ever been, but the fact that we've just climbed the highest mountain in Africa finally starts to settle in, and our feeling of accomplishment begins to overshadow the pains and aches in our bodies. We spend the afternoon commiserating over how incredibly challenging the trek was, and revelling in the feeling of accomplishment of having successfully pushed ourselves to the top. We eat a hearty dinner and go to sleep around sunset. The next day holds three more hours of downhill hiking, but our desire to take a shower and sleep in a bed keeps our eyes on the prize. 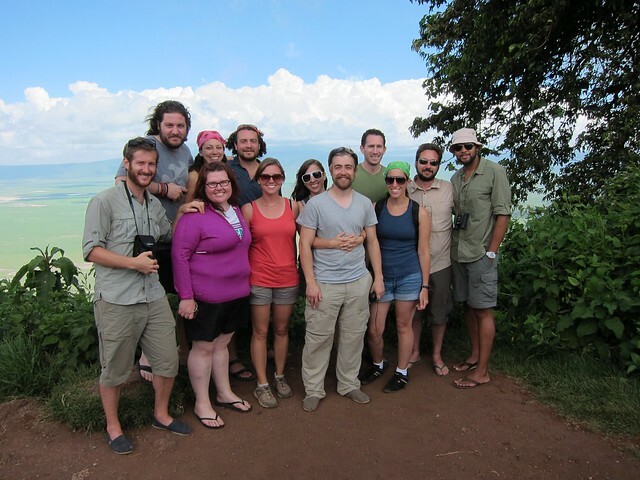 Before we know it, we're back in Moshi, gazing up at the top of Mt. 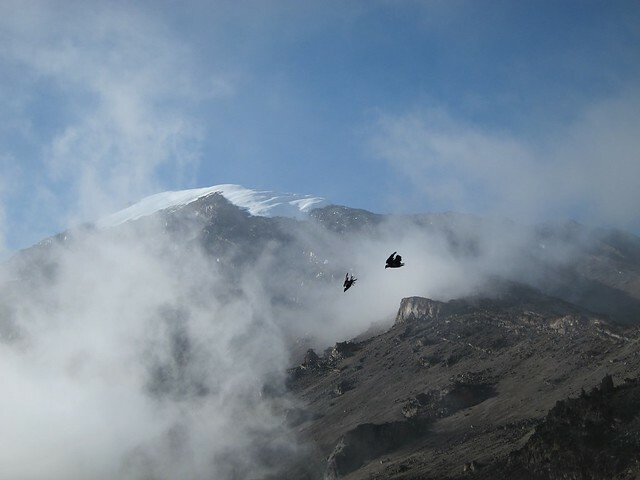 Kilimanjaro from its base, wondering how in the world we got up to the summit! 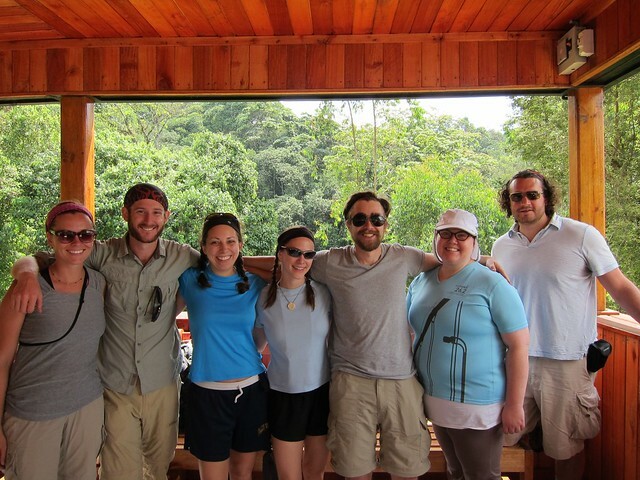 Logistics: We used Peter Tours and Mountaineering, after reading our friends' review. The price was fair and we found the service to be wonderful: our guides were friendly and professional, the food was plentiful and delicious, and the tents and sleeping bags were in good condition. 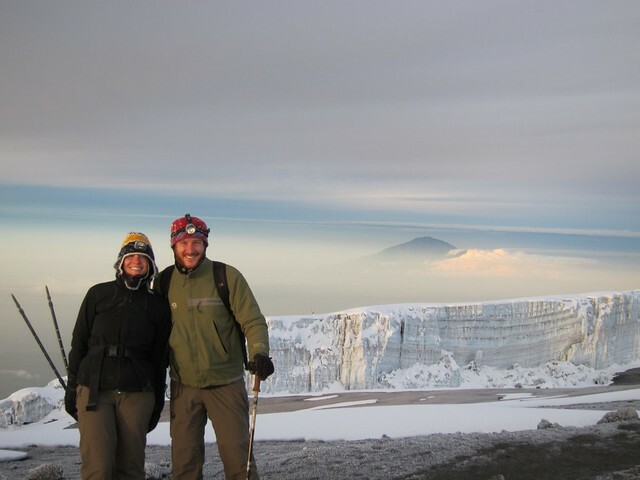 We did the Machame route in seven days, but it can be done in six. Having an extra day allows for the last hike before the summit push to be done over two days instead of all in one, which allows you to be better-rested for the long haul to the summit. Upon arriving at Gombe Stream National Park, you get the feeling that you are landing at a research station more than a park. There's a reason for that: this is the site of the longest ongoing study of any animal population in the world, the study of chimpanzees that Jane Goodall started in 1960. 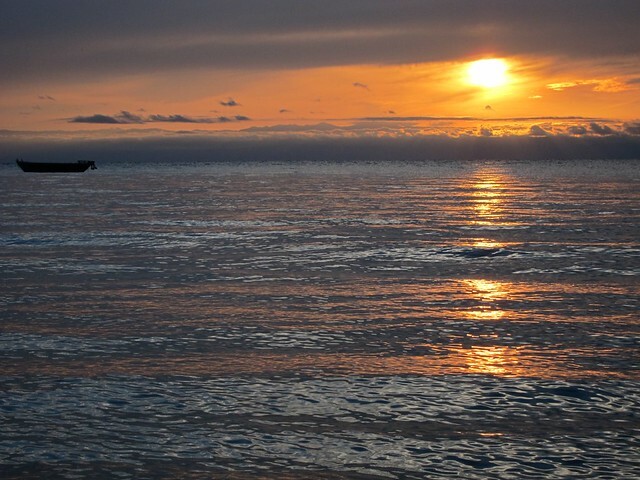 The park is tiny by Tanzania standards at only 52 sq km, and is located right on lovely Lake Tanganyika. 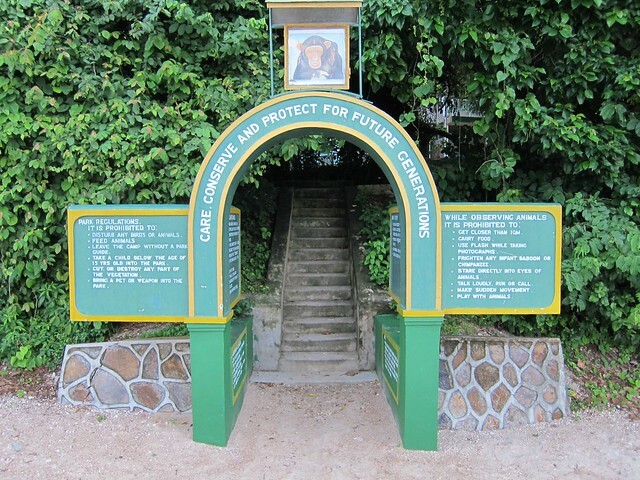 There are no roads into or inside this park; the only way to get there is via "lake taxi" from the nearest city of any size, Kigoma, which is about 3 hours away. 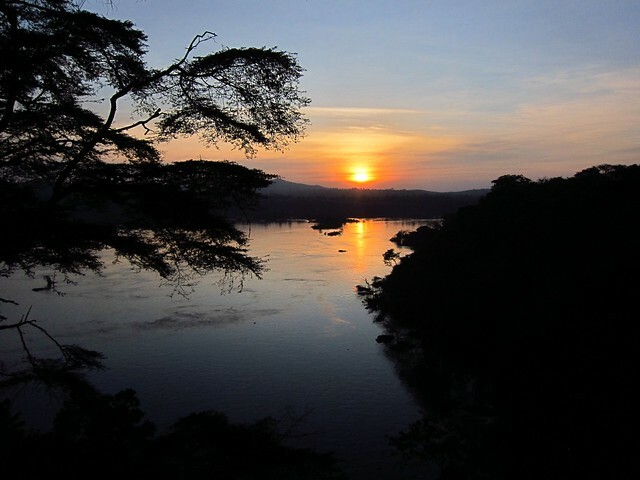 The lush forest here has made a great habitat for these primates because of its natural boundaries: the lake to the west and the high wall of the rift escarpment (rising about 750 m above the lake) to the east. This small park is packed with 16 valleys containing streams that flow year-round. Besides the chimps, there are several other primates, including red-tailed, red Colobus, vervet, and blue monkeys, but these are harder to see, because they are scared of humans since they are occassionally hunted by the chimps. Baboons are everywhere as well, but we've grown to think of these guys as the racoons of the primates; they're always scavenging around humans trying to steal food, and on one occassion during our stay they succeeded in sneaking into the rest house, running up the stairs, and grabbing a whole bag of bread from a woman who was eating her breakfast! We had heard from another traveller that tracking the chimps here is just as rewarding if not more than the gorilla tracking that is famous in Uganda and Rwanda (and to a lesser extent the DRC) and it is one-fifth the price, so we decided to include it on our Tanzania itinerary. Chimp "tracking" essentially involves going into the forest with a guide (you are not allowed to enter it without one) who is communicating via walkie-talkie with the researchers to find out where the chimps are hanging out. Then the hard work begins: climbing through thick vegetation on often muddy ground, up and down the steep, humid valleys until you reach the playful primates. 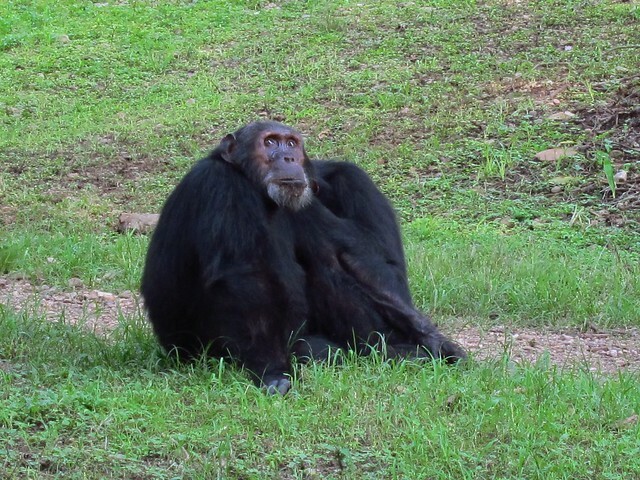 There are three populations of chimps in the park, the Mitumba, Kasekela, and Bwavi. The Kasekela are the ones who live in the area closest to the center of the park, where all visitors arrive and most sleep, and where the researchers and staff live. They are therefore the most habituated to humans and the ones most commonly tracked. We arrived at the park on a Friday afternoon, and we hadn't even been there for an hour when one of the park staff came to our room in the rest house to tell us to come outside because a bunch of the chimps were hanging out nearby. We hadn't been expecting to see any until the next morning when we were going tracking, so the scene we walked into was a wonderful surprise: about six to eight male chimps were sitting right outside the staff and researcher housing, some just lounging, some climbing the trees to snack on leaves, and others grooming each other, an act that we would see a lot of the next day as well. Essentially one male sits behind the other and looks for bugs and ticks in his fur and picks them off. Grooming serves a social purpose, as well as a hygenic one, as it defines and reinforces the community's social heierarchy. We watched them from about four or five meters away for about half an hour or so before they left the area. The next morning, we set off with our guide and one other visitor. We had only been walking through the forest about one hour when we reached a group of chimps and researchers, and so began our morning of chimp tracking. We followed them as they swung from the trees, stopped briefly to eat, then ran off to their next destination. After about a half hour of following them (not incredibly easy, as they take routes over, under, and through thick brush that we can't nvaigate), they finally settled down and stayed in one place for awhile. We sat about four meters away from them while they groomed, ate, played, ate some more, and even mated! 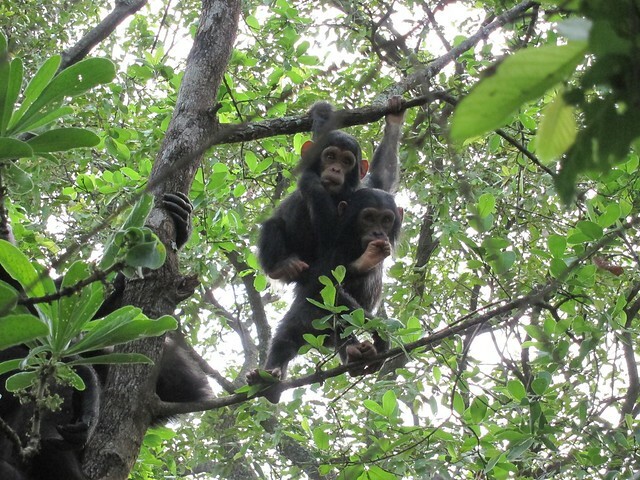 We were lucky enough that this group included an absolutely adorable seven-month-old chimp, who hyper-actively and clumsily played with another young chimp, swinging from trees, jumping on other chimps, and occasionally falling off the branches. It is hard to put into words how incredible these primates are and what a special experience watching them in their natural habitat is. I'm sure most people have seen them in zoos, but seeing them in their own environment is a completely different story. They are our closest relatives--we share 98% of our genes with them--and this fact is apparent in the way they move, sit, lay down, interact with each other, and in their facial expressions when looking at each other or at us humans. They walk on all fours, but stark differences between us and chimps end there. 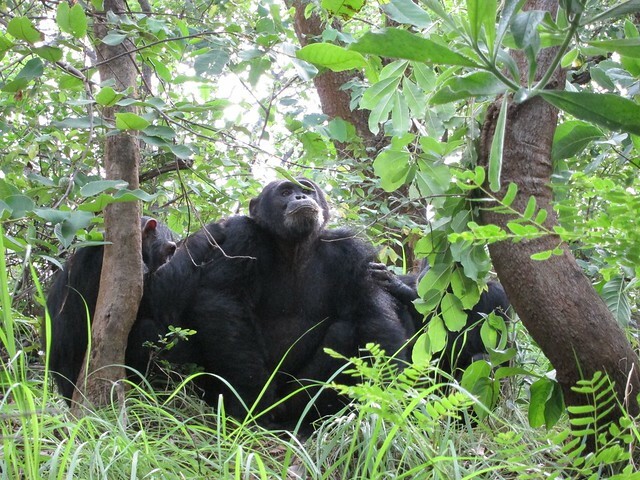 At one point one of the males was laying on the ground, simply relaxing with his arms folded, fingers intertwined behind his head and legs crossed, ankle over knee, gazing up at the tree canopy--much the way you'd see a human lounging on the beach. They are completely aware of the humans who are watching them, but are unphased by it and carry on as if we were not there. We loved watching the way they groom each other, the way they make loud noises and whoop-whoop calls to communicate to each other where good food has been found, and of course the playful manner in which they interact. We saw happy, scared, and relaxed facial expressions that reminded us of ourselves. Even the way they simply scratch themselves or put an arm around a fellow chimp looked so familiar. We were surprised to see a male and female mate twice, mere meters away from us! Unfortunately, the act only lasted about two seconds-- not long enough for us to switch the camera to the video setting. We were also amazed to see how four younger males ran up to a larger, older male as he approached the area, put their arms around him and led him to a clearing where they sat him down and started grooming him--he is clearly a well-respected elder and therefore carefully and lovingly taken care of. We sat in awe and observed scenes like this for almost 90 minutes (visitors are only supposed to spend an hour with the same group at a time, but our guides clearly lost track of time...) until the chimps gradually moved on to another area. I'm not sure the photos or our description does the whole experience justice, but it was honestly the most incredible wildlife experience we've ever had. We can definitely understand how Jane Goodall dedicated her life to these awesome creatures, and are so humbled to have been able to spend some time with them here in their home. A boy walks up to your bus trying to sell you a mousetrap, razor blades, wallets, and watering cans. A woman walks down the highway carrying an infant on her back and the largest sack of potatoes I've ever seen on her head. A truck drives by with several large, dead fish hanging off the side mirrors to dry. A man pulls up on a bicycle with six live chickens tied to the back of his seat. The captain of the boat that was supposed to leave at noon tells us at 2:30 pm that it's looking like we'll probably leave around 4:00 pm because one of the passengers is still running a few errands. The power in town has been off for three of the last five days, but no one's complaining and business goes on as usual...This is Africa. 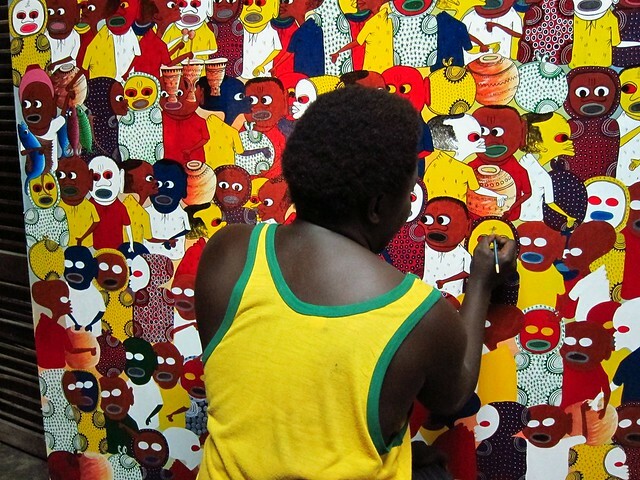 "This is Africa" or "TIA" is a term we learned almost immediately upon entering Mozambique. It's the phrase that's tossed around whenever an explanation simply doesn't exist for why or how something is happening in Africa. You shrug your shoulders and simply state "TIA". I don't want to make sweeping generalizations, and can only speak to a small part of southern and eastern Africa that we've seen so far, but there are commonalities among the countries we've been to. It's a region of beautiful vistas, but the landscape is often littered with plastic bags as far as the eye can see; a place where some work incredibly hard round the clock with neverending perseverence and others seem to sit around and wait for handouts; a continent where it seems that most villages don't have electricity but almost all villagers own a cell phone. Things happen at their own pace and get done in their own way. It can be challenging for a mzungu (a Swahili word literally meaning European but used to describe any white person) such as myself to make sense of it all. The ability to at least try to put aside any expectations of sticking to a schedule, especially when it comes to transportation, is quite possibly the most important trait you can possess in order to survive--and more importantly, enjoy--a visit to Africa. Time has a much different meaning than what we are used to in the US. I'm not going to pretend that I haven't had my moments of frustration when "African Time", lack of personal space, being charged twice as much as the locals for a bus ride, or hearing "hello my friend will you please take a look at what I want to sell you" when I really don't want to has gotten the better part of me. In Nkhata Bay alone we spent three days in a row waiting for a ferry that never came, and then another boat that kept postponing its departure time until it decided not to depart and we finally decided to stop wasting our time waiting (unfortunately, due to logistics, this caused us to leave Malawi five days earlier than planned). 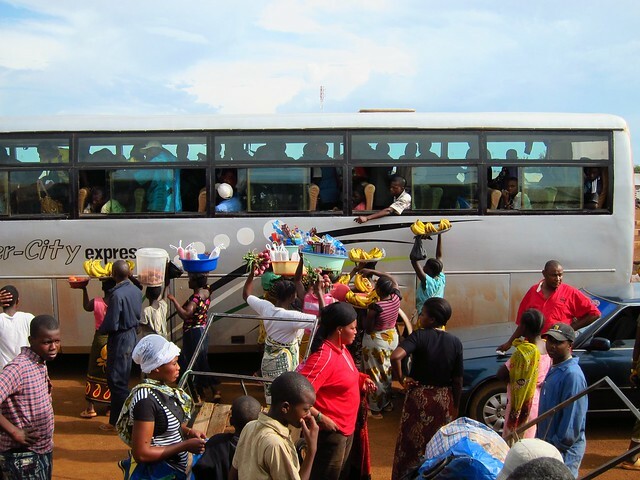 Scheduled departure times-- heck, even scheduled departure dates-- are loose estimations, and no one but the mzungus seem to be upset when they end up being off by hours or days. On public transportation, there is no such thing as having your own seat, or any personal space, for that matter. I am not exaggerating when I say bus rides in Africa make the Paris subway smell like a flower shop. Your face is the color of a tomato, you're sweating profusely, armpits are centimeters away from your nose, babies are in your lap, chickens are held like hand luggage, bags of food are sitting under your feet: This Is Africa. 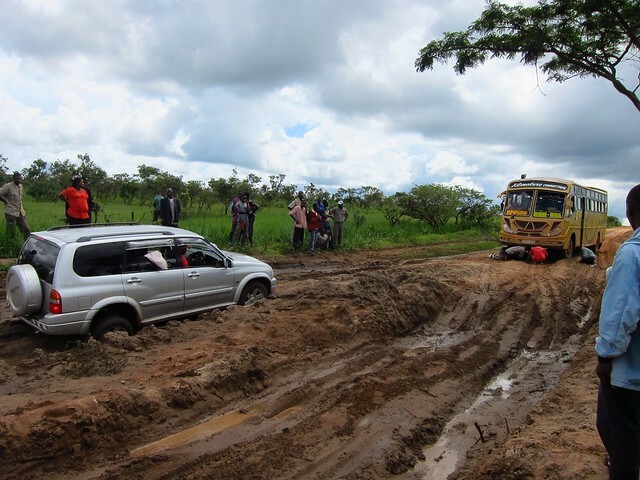 While travel in Mozambique, Malawi, and Tanzania has been the toughest we've experienced, we try to remember to appreciate the experience for what it is. I have learned to take a deep breath, look out the window, and take it all in: the dozens of brightly-clad women and children running up to the bus as it pulls into a town to sell us bowls full of ripe mangoes, avocadoes, pineapples and bananas, the man holding a chicken who's been standing in the aisle next to me for the last four hours, or the many women walking dangerously close to traffic speeding by them (there are no sidewalks), balancing anything from huge baskets of fish to a bucket of water to a broom on their heads. It's nuts; it's chaos; it's kind of beautiful in its own way.